This is not my pattern. It was written by Steven Wyckoff of www.wyldscallyns.com, and I found it here on Ravelry. Unfortunately the pattern no longer exists anywhere on the internet, so I am posting it here as found originally. It's just too cute to be taunting so many people on the internet with no pattern. 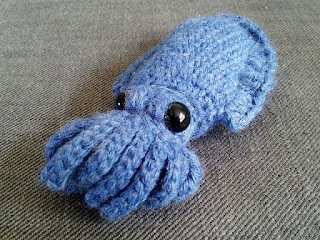 The example cuttlefish was done using a 4.00 mm (US G6) hook, blue worsted weight Lion Brand Wool Ease, and 3/8 inch safety eyes. You will also need a tapestry needle (to sew the head onto the body) and some sort of stuffing. 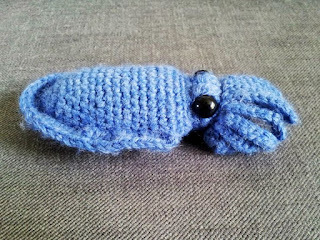 Feel free to use a different hook, yarn, or eyes if you prefer. 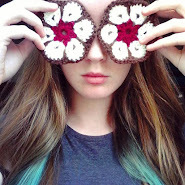 blo = back loop only single crochet. This should leave an extra bar on the outside of the critter. 3bauble = Basically you will do three double crochets that all go into the same stitch, and then are closed off with a single, final pull-through. I guess that is [y/o, hook through stitch, y/o pull through, y/o, pull through 2 of the loops, leaving two on the hook] x 3 y/o pull through all four loops at once. This should make a bit of a bump but won’t be an increase or a decrease. The body and head are done in the round, and I like to start with a magic loop. The trick here is that your increases should be coming from the sides, not spread evenly as you would for a sphere; we’re trying to make a creature that is shaped more like an almond than a ball. The body should be worked in the round. Fringe: Work slip stitches along the surface of the body about where your increases are coming from. I had to kind of take what I could get as far as keeping it straight and even. I used the last row of 24 as my starting and ending point. Once you have a base of slip stitches to work from, double crochet one row all the way around. For my fringe I did about 1 double crochet per slip stitch, but if you want a more ruffly fringe you should do more. 3-5 double crochet per slip stich would be much more ruffly. Row 5: sc 15 (15) When you get to the tentacles/arms, work into the back loops of row 3, making sure the arms are on the outside of the critter. <tentacle>: chain 10 out away from the head. Then turn and work back: sl 2, sc 3, hdc 4. Once you get back to the head, slip stitch to the front loop only of the stitch you would have been working into if not for the tentacle. The back loop will be left for the next row to work into. This whole thing should use one stitch from the row below but leave a long tentacle hanging off. <arm>: chain 10 out and slip stitch 10 back with the last one being into the row below. Use safety eyes and attach them on the outside of the bumps created by the pairs of baubles. I put mine between the two baubles but you can feel free to put them wherever looks the cutest. Once the eyes and fringe are in place, stuff both parts and sew the head onto the body. That’s it! While I have crocheted a number of things without a pattern, this is the first time I’ve tried to formulate my ad-libbing into a pattern someone else could follow. Let me know if you find any mistakes and posts pics of your FOs! I will be sharing mine soon, so keep an eye out for that and show me yours too! OH MY BOB THANK YOU! This pattern is a staple of my stash-busting! 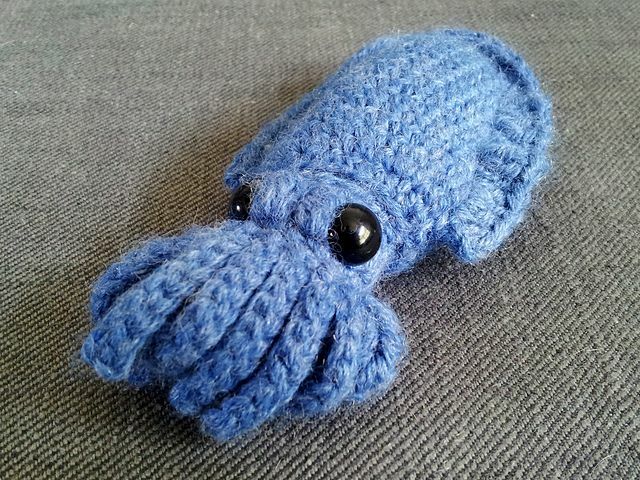 I'm so happy you can be reunited with your cuttlefish pattern!